Olly Kirkland Reports: Well, having failed to bring the club to its knees over the course of my 2 year tenure as Chair, I thought it only fair to be given a second chance in my new guise as Men’s Road Relays Manager. As anyone who knows me a little bit will be aware, what I lack in organisational abilities, I more than make up for in forgetfulness. And so it proved in the build up to my first event as manager when I managed to leave 2 loyal members out of the teams…sorry Barrie and Tony. But cometh the hour, cometh the men, and somehow all 19 selected runners appeared in the right place at the right time. Thanks to Steve and John who, together, managed to get the 3 man 55 team off and running prior to my arrival, giving me the opportunity to register the rest of the teams, collect the numbers, sit down at my desk and ensure that everyone was allocated the correct pieces of paper. So far, so good. Pete Hickman, meanwhile, got the 55 team underway, with a hard run over the 3 mile course, finishing his leg in 31st place with a time of 20.44. Pete was followed by Steve Doswell (22.57) and John Cheel (23.21), who brought the team home in a very creditable 33rd place. After this race, rumours started going round that the Race Director wanted to speak to the Bournville Harriers Manager. I went to the desk to find out what the fuss was and was advised that it can’t have been anything important, so put it down as a hoax. Shortly before the next races started, I was finally tracked down by the aforementioned director and advised that I had neglected to actually assign a runner to the 5th leg of the 35B team. Oh well. This minor issue resolved, the 35 race got underway, shortly followed by the 45s. Dean Parker ran the first leg for the 35A team and, on the back of a 5k PB the previous week, got us off to a flier with a fantastic time of 15.43, leaving us in 9th place. Dean was followed by a slightly less prepared and more jet-lagged Paul Thompson, who fought his way round in 17.26. Iain Jones consolidated our position with a solid 17.14, followed by John McKeon and myself, who both ran legs of 17.42. A good finish from Richard Rollins (18.06) left is in an encouraging 16th place. For the 35B team, Andy Hoole started things off with an impressive 18.24, followed by Jim Clarke, making his debut for the club with an excellent run of 19.43. Dave Powner (20.49) and Dan Harvey (21.47) ran the middle legs before really powerful runs by another debutant, Adrian Fowler (18.24), and Matt Slater (18.42) saw us gain 7 places up to 33rd, ahead of both the BRAT and Tipton B teams. The 4 leg 45 race started a few minutes after the 35 one and Andy Wheeler ran the first leg in exactly 18 minutes, followed by Stuart Pearson with 18.15. Daniel Wilson ran the 3rd leg in 19.12, with Dave Harte bringing the team home in 34th place with a final leg of 18.54. Overall, a very successful and enjoyable afternoon for all of the men’s teams. The 6 Stage Midlands Championships are scheduled to take place in Sutton Park over a slightly longer 3.6 mile course on Saturday 24th September. I hope that we are able to put at least 4 teams out, so if you are even slightly curious, please give it a go and let me know you are interested when I put out the official invitation in August. This entry was posted in Club Races, Race Reports, Road Relays by BvH Admin. Bookmark the permalink. 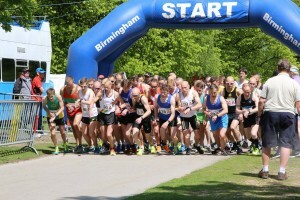 Thankyou Olly for your excellent Report on the recent BMAF Road Relays at Sutton Park. I `enjoyed` watching both the BvH Women and Men competing in this prestigious National event in the annual race calendar —- And I thought that the general standard of performance was remarkably good when one considers that a number of our runners had been running much longer distances in the recent past. Good to see recent arrivals participating. Congratulations to our Road Relay Managers and their Teams for enabling a successful/enjoyable `day at the office` for Bournville Harriers. / / PS.Bournville Harriers could finish higher up the National Team Rankings with more medium/long term preparation for such events as the Road Relays. But as,primarily,a road running/cross country club;albeit,with a handful of potentially quite good track athletes,and some who aspire to ulta-style events `we` may well decide to continue just as we are. There is `a creative tension` between participation and performance! Perhaps the Coaching Team can continue to encourage BvHers to plan their running over the whole annual cycle;thus,enabling appropriate preparation and post race recovery time. But,most of us are not professionals,but amateurs — And run just for fun! And that is OK— But we may have a handful of budding semi-pros in our midst— and that`s OK too!